It was only back in October that YIMBY reported on 53 West 53rd Street’s surpassing its 50th floor. Now, the supertall residential tower designed by Jean Nouvel is just about to top-out, with an estimate that formwork should be complete by early March, as the last concrete is poured above the 1,000-foot mark for the iconic skyscraper. 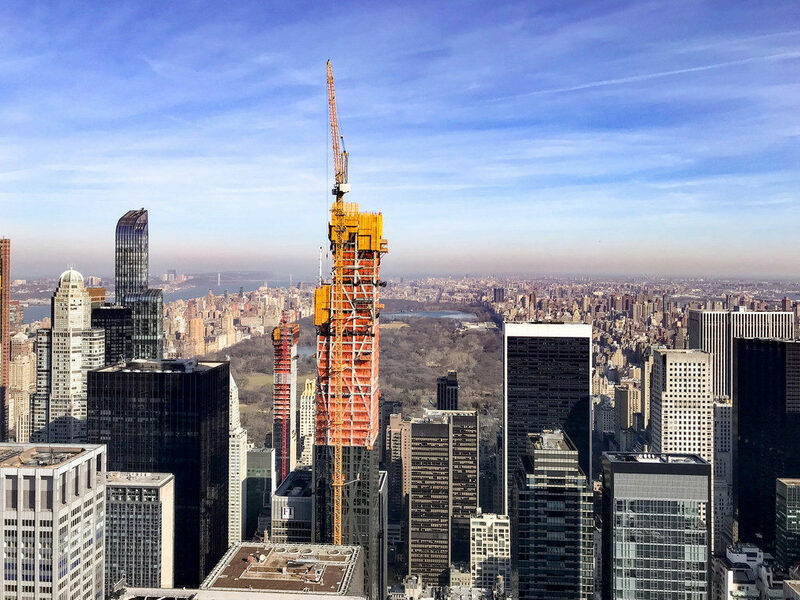 The latest photo from Tectonic was shot from the Top of The Rock observatory deck, and shows that the framework for 53W53rd has reached the parapet height of One57 a few blocks to the northwest, at 1,005 feet above street level. There is about fifty feet of concrete remaining before the tip of Torre Verre will be complete, but according to on-site sources, that day is only about a month out. Besides progress on the structure, the exterior is also making substantial headway, and appears to be over halfway to the future rooftop. The sleek black facade is already quite striking, and the next few hundred feet should cement the tower’s status as an imminent icon of the Midtown skyline. While 53W53rd will be the latest residential building of the 57th Street boom to reach its pinnacle, its origins actually make it the first of the typology proposed for the corridor, with the initial concept first revealed in 2007. After a very controversial approval process, the building lost its top 200 feet to the whims of Amanda Burden, resulting in its current format. 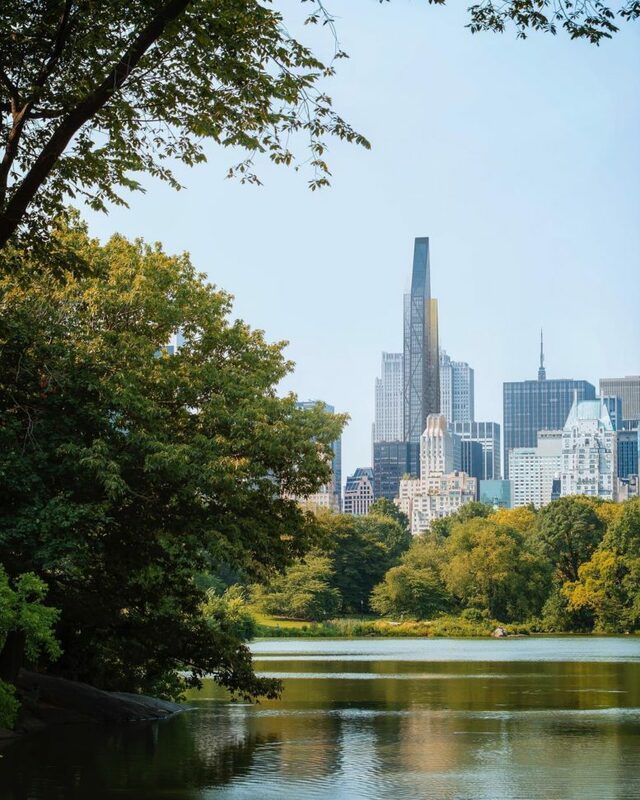 Adjacent to the Museum of Modern Art, 53W53rd will ultimately yield 145 condominiums. The on-file floor count totals 73, while the marketing number is 82. Hines, Pontiac Land Group, and Goldman Sachs are the developers behind the project. Completion is anticipated by the end of 2018. 8 Comments on "Jean Nouvel-Designed 53 West 53rd Street Reaches Supertall Status, Nears Topping-Out"
Please pardon me for using your space: Its crown of the head is coming, take a look at prominent skyscraper. Amanda Burden didn’t think the building deserved to be in the same view plane as the Empire State, she was right. She was wrong if protecting the Empire State Building was her motivation, but even in truncated form this will be a stunning building in its own right. Two floor counts – one is 73, one 82? Explain. That’s nine (9) floors unaccounted for! And what is “Torre Verre”? The nine floors add substantially to pricing when it comes to comps! Torre Verre is the project’s original name. The change was not an Amanda Burden whim. The block association campaigned for the reduction of the height of this ridiculous mid-block piece of construction, including a law suit and she wisely made the decision to reduce the height. Not enough in my opinion. What is ridiculous about this building or it’s height? This is the middle of midtown, one of the denser places on the planet. Do you think the extra 200 people are going to overwhelm the infrastructure? It’s one building in from 6th Avenue, and next to MOMA so not exactly a quiet side street. Amanda Burden made a silly decision to appease nimbys to knock 200 feet of this tower. This made absolutely zero difference in zero people’s lives. Congratulations nimbys. Too bad for you 5 more went up that are even taller.